Indian consumers have voted ItzCash, India’s largest Fintech payments company, amongst the most trusted Banking Financial Services Brand. 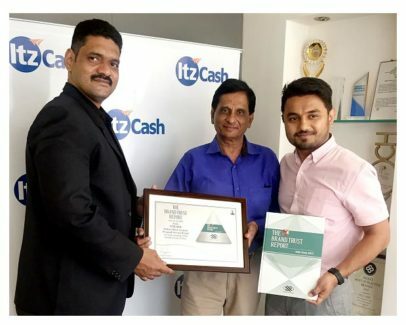 ItzCash ranked among top 30 across the entire BFSI segment pan-India and stand as the category leader in ‘Most Trusted brand in Prepaid Services’, according to ‘The Brand Trust Report, India study 2017’ released by brand analytics firm TRA Research (formerly Trust Research Advisory). This amongst leading BFSI brands like SBI, LIC, ICICI Bank, Axis Bank, HDFC, HSBC, American Express, Kotak Mahindra Bank and Visa among others. The study showcases that ItzCash provides innovative digital products to its customers and has a trust factor associated with it. Spread across 3000+ cities through its robust franchise network, ItzCash is the only FinTech payments platform serving across both online and offline channels and is known as ‘PhyGital’ cash of the country (Physical reach+ Digital capabilities).